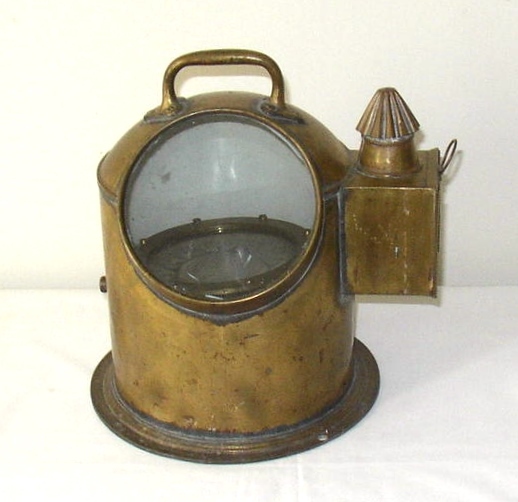 Late 19th/early 20th C. brass helmut form brass binnacle with its original wetcard compass, carrying handle and side light with burner. The compass card is signed “Dobbie Mcinney & Clyde Ltd., 57 Bothwell Street, Glasgow”. It is in all original condition with a nicely aged surface patina. Size is 9″ tall without handle, 10 3/8″ tall with handle, and 7 1/4″ diameter including the bottom flange, 8 5/8″ without the flange. Tags: Binnacle, Brass, Compass, Dobbie Mcinney & Clyde Ltd.